Be the first to share your favorite memory, photo or story of QUINN. This memorial page is dedicated for family, friends and future generations to celebrate the life of their loved one. 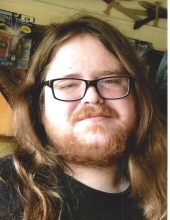 QUINN M. ADLARD, Age 27. Beloved son of Diane Adlard (nee Goforth) and Mike Adlard (Karen); loving brother of Kyle Adlard and Meghan Brown; grandson of Charles “Chuck” and the late Margaret “Peggy” Adlard and the late Jean and James Albert Goforth. Nephew of James Goforth (Jennifer), and Frank (deceased). Cousin of Faith, Jimmy, and Abby Goforth. Passed away Tuesday November 20, 2018. Funeral Mass St. Mark Church 15800 Montrose Ave. Tuesday, November 27 at 10:00 a.m. Interment private. Friends may call at THE MCGORRAY-HANNA FUNERAL HOME OF WESTLAKE 25620 CENTER RIDGE RD (WEST OF COLUMBIA) MONDAY 4-8 PM. "Email Address" would like to share the life celebration of QUINN M. ADLARD. Click on the "link" to go to share a favorite memory or leave a condolence message for the family.